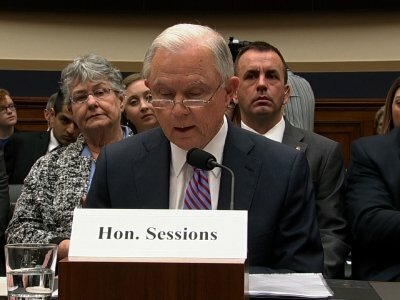 WASHINGTON (AP) — A defiant Attorney General Jeff Sessions told Congress on Tuesday he never lied under oath about Russian interference in the 2016 election and said sleep deprivation and the “chaos” of the Trump campaign clouded his recollections of campaign contacts with Russians. Sessions sought to explain away apparent contradictions in his public statements by portraying President Donald Trump’s campaign as an exhausting operation and said he could not be expected to remember specific encounters from more than a year ago. Sessions, then a senator from Alabama, led a foreign policy advisory council for the Trump campaign. He has been dogged since January by his evolving explanations about his own foreign contacts during the campaign and about how much he knew of communication between Trump associates and Russian government intermediaries. Sessions said he had no recollection of the conversation with Page. And he said that though he did not initially recall a March 2016 conversation with Papadopoulos, he now believes after seeing media reports about it that he told Papadopoulos that he was not authorized to represent the Trump campaign with the Russian government or any other foreign government. Sessions insisted that his story had never changed and that he had never been dishonest. But he also suggested to the committee that it was unfair to expect him to recall “who said what when” during the campaign. On Tuesday, Sessions said that any such review would be done without regard to political considerations.